Spring once again blushes the face of Japan, nowhere more so than in Yoshino, the nation’s most famous sakura (cherry blossom) viewing destination and UNESCO World Heritage site. Each year, the sleepy mountain village in Nara Prefecture comes to life at the end of March in anticipation of the monthlong hanami (cherry blossom viewing) season that attracts many hoping to see Yoshino’s 30,000 sakura in bloom at least once in their lives. There are two main reasons for the popularity of Mount Yoshino’s sakura: one spiritual, one practical. The trees are considered sacred because En no Gyoja, a 7th-century sorcerer and founder of the Buddhist-Shinto fusion sect called shugendo, had a vision and carved what he saw into the bark of one of Yoshino’s cherry trees. Yoshino was already renowned for its shiro yamazakura (white mountain cherry trees) when shugendo practitioners began planting more around the area, resulting in the mountain of white flowers that arrives each spring at present. Japan’s most popular varieties of sakura are cultivated ones, such as Somei Yoshino with their five perfect and slightly pink petals, or the yaezakura varieties, bursting with up to 50 large petals in colors ranging from deep pink to pure white. That said, the five small petals on shiro yamazakura have a wilder look more suitable for Yoshino’s mountain setting. The practical side of Yoshino is that, unlike the scant week of flowers in many cities, the sakura here are in bloom for a month and in full bloom for more than two weeks. Yoshino village straddles a ridge that rises from 150 meters to 850 meters and runs deep into the Omine mountain range, with sakura lining the adjacent valleys. 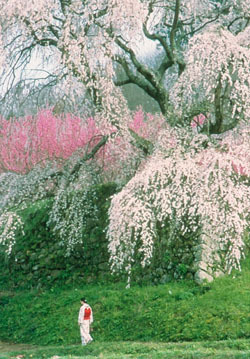 As April passes, the flowers progress up the mountain through the four regions known as the Shimosenbon, Nakasenbon, Kamisenbon and Okusenbon, the lower, middle, upper and inner thousand trees, respectively. The Shimosenbon around Yoshinoguchi Station and the small cable car leading up to the main village bloom first, dramatically welcoming those who have survived the crush of the train ride. While the Shimosenbon area has fewer open places for hanami, the historical buildings there provide a great setting for the surrounding trees. 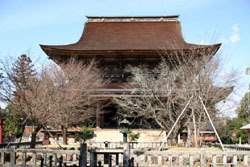 Kinpusen-ji Temple dominates the village with its massive double-roofed main hall, visible from every good vantage point. 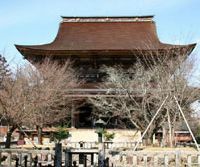 Dating back to at least 1103, the national treasure and its three gates mark the entrance into sacred ground for followers of shugendo. The main hall has an appealing rough-hewn look: the pillars are cracked or warped in the shape of their original trees, while much of the red paint on the exterior has flaked off in the beating the temple takes each winter. Nearby, Yoshimizu Shrine is notable as the epicenter for a tumultuous period of Japanese history and for its famous guests. In the 12th century, Minamoto Yoshitsune (1159-89), a legendary general in the Gempei War, stayed here, fleeing attempts by the shogun (his half brother) to kill him. When Emperor Go-Daigo (1288-1339), his army defeated, had failed to wrest power from the Kamakura Shogunate, he fled to Yoshino and set up a southern court, staying at this shrine while his palace was being constructed. Yoshimizu Jinja was also the setting for daimyo Toyotomi Hideyoshi’s 5,000-person hanami in 1594. Shortly after he arrived it began to rain, not letting up for three straight days. According to local legend, Hideyoshi was so incensed he threatened to torch the whole mountain if the monks didn’t change the weather. Fortunately their prayers were answered the next day and the party began. These days the shrine features a hito me senbon (thousand trees in a glance) viewpoint, as well as artifacts dating from the stays of Go-Daigo and Hideyoshi. 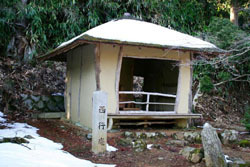 Above the Shimosenbon are the Nakasenbon and Kamisenbon areas, both of which have broad grassy tracts available for picnics. It is here, at a higher elevation, that one can really appreciate the scope of Yoshino’s sakura: looking up, the trees wash the ridge and valley in a sea of white petals, while looking back toward the Shimosenbon one can see the hall of Kinpusen-ji against the skyline and numerous trees blooming among houses or in the cedar forest west of the ridge. Chikurin-in, one of Yoshino’s temple-inns, has a great garden designed by tea master Sen no Rikyu (1522-91), with weeping cherry trees draped over a pond stocked with koi and a large hill with gazebos for poor weather. Nearby, the Sakura Exhibition Field in the Kamisenbon has arguably the best views and seating, commanding a broad panorama of the mountains and valleys. The area was once the location of a signal tower for Prince Daito, son of Emperor Go-Daigo, and was used in his battles against the Kamakura Shogunate. Last is the Okusenbon area, recommended for those arriving late in the season or for hopeless romantics. 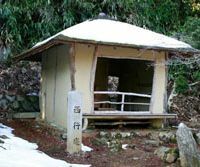 The small clearing features a hut where Saigyo, a 12th-century poet-priest, once lived for a few years, composing poetry and contemplating. Okusenbon is a bit of a misnomer, as there are probably only about 200 trees here, and while Saigyo’s clearing is unlikely to be as peaceful as it was in his day, it may be quieter than the rest of Yoshino due to the one-hour hike from the Kamisenbon. There is, however, a bus running from Chikurin-in to the shrine near the peak that will cut the exertion, if not the time it takes to arrive. 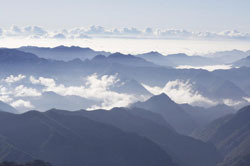 Walkers will also appreciate the view from Mount Takagi, the highest viewpoint over Yoshino village. 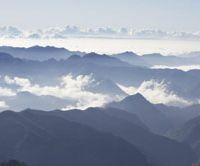 Beyond the Okusenbon lies the Omine Mountain pilgrimage route and the Yoshino Kumano National Park, part of the World Heritage Site encompassing much of the Kii Mountain Range. This 1,200-year-old trail links Yoshino’s Kinpusen-ji with the Kumano Hongu Taisha shrine in Wakayama Prefecture, and is scattered with holy places where yamabushi (mountain priests) attune themselves to the deities of the wilderness and the spirit of En-no-Gyoja. 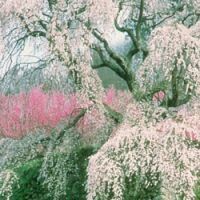 A sudden blast from one of their conch-shell horns, echoing through the valleys, is a reminder that cherry blossoms may be celebrated all across Japan — but here they are revered.